Exeter head coach Rob Baxter expects his side to learn from their 36-18 loss at Saracens in the Premiership. The win enabled Sarries to move above Exeter and return to the top of the table with four games left this season. "Good teams show resilience and show character, and that's what I'm going to expect from our lads," Baxter said. "I'm expecting them to show resilience and character and make this game not a one-off, but an experience that we've learnt from." 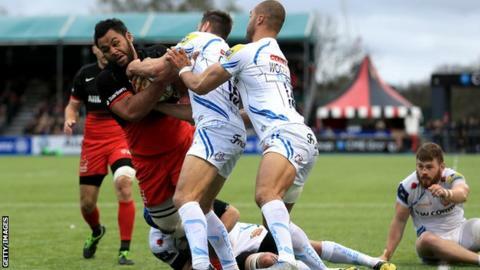 Saracens brought back five players that had won the Grand Slam with England into their side, while Exeter were forced to make a number of changes. The London club lead the Premiership with 62 points, three clear of the Chiefs, who are a point ahead of third-placed Wasps. "I don't think we were at our best, but sometimes you have to be honest and give the opposition credit for playing well, and that puts you under some pressure that stops you playing to your best," Baxter told BBC Radio Devon. "We've got to turn up at training this week and reset ourselves, get on with things and not get too knocked around by one individual score. "We came here and won last year against a Saracens team that were struggling to get into the top four, and they won the Premiership."